We introduce to you, the beautiful Margeaux! How did you get into fitness? What inspired you? I have always been a very athletic person. I've played soccer my entire life, as well as competitive cheerleading. When I was a freshman in college I tried to find ways of staying active, but I didn't feel like I would have the time to join a team of any kind. So, I started working out in my dorm. It was fun and I started to see my abs! Then my boyfriend moved back home from school, and he introduced me to the gym. We started going routinely and he introduced me to lifting weights. I became addicted to the way I felt during and after working out. I loved the amount of energy that I had acquired and was able to sustain throughout my day! I wasn't always a confident person, and I gained a lot of my confidence and happiness through working out. I guess you could say I inspired myself in finding out what I was capable of. It's been a part of my life and me ever since. How important is health/fitness/nutrition to you? Being healthy and fit is everything to me. Your daily activities and how you feel during them depend on how well your body is functioning. If your not fueling your body with the proper nutrients and love it deserves than how can you expect it to treat you with love in return. I wake up every morning with the desire to feel good and have a productive day and when my mind, body and soul are linked up, it's unbelievable what I'm able to accomplish. 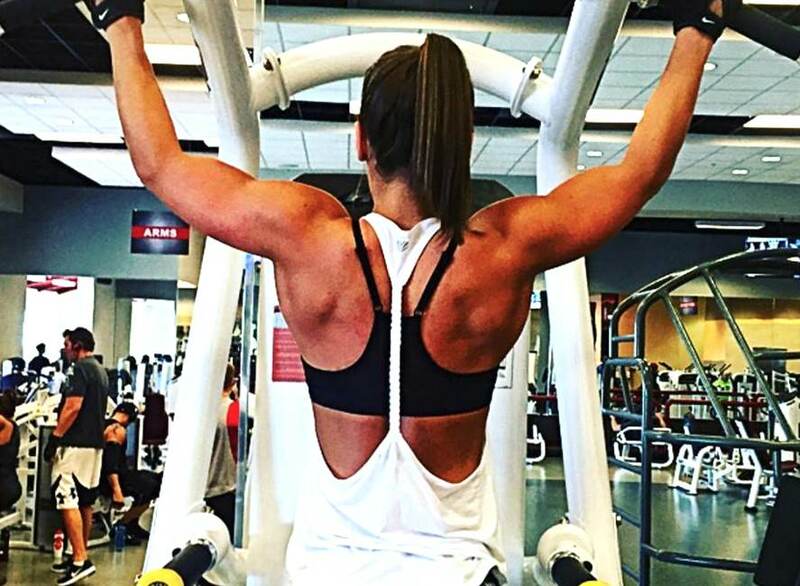 What does a normal workout week of fitness routines look like? I typically workout 6 days a week, for about an hour and a half to two hours. I try to go in the mornings most days. I find that I tend to be more productive and energetic throughout my day once I've worked out. I like to combine different variations of workouts in my routine, a little bit of hiit (high intensity interval training) with weight lifting, some body weight workouts and core or stability workouts. I always vary my workouts as well. I like to keep it fun, sweaty and different! In the summer I will add in a few days of hiking, running outdoors or hiit workouts at the park just to mix it up! It’s also important for me to warm up prior to all of my workouts and cool down afterward with a good stretch; this is why they can sometimes take up to two hours. What does your average daily intake look like? It depends on my activity level most days. When I eat, I do so with the intent of fueling my body. For breakfast it's typically a fruit and vegetable juice (kale, beets, pineapple, flax seed and water). If I have an energy rich day ahead of me I'll make a breakfast bowl as well (oat bran, flax seeds, chai seeds, unsweetened coconut flakes, cinnamon, almond butter and fresh fruit). For lunch I go with my heavier meal of the day, maybe a veggie loaded flatbread or homemade clean (when I say clean I mean, all natural, organic, homemade, nothing processed) chicken tacos. Dinner is my lighter meal of the day, salmon with edamame is a favorite of mine or another go to of mine is salad loaded with tomatoes, cucumber, spinach, kale, peppers, and other goodies topped with olive oil and vinegar. I'm not a big snacker to be honest but if I do it's usually just an apple or banana and maybe another smoothie with different ingredients. Your intake should match your energy output. If you do a lot in your day, when it comes to moving around and being active than your food intake will be greater. How do you balance fitness, a social life, and work? Advice for women wanting to take health more seriously? Look at health as a fun thing and not a task! This is extremely important. Thinking of health in a negative way, like a diet, already sets us up to fail. Just be fun with it, and think of it more as a lifestyle change. Don't be too strict on yourself either. Take it slow and work your way up. It's about finding what works for YOU. My kale smoothies might make people cringe but I actually enjoy them. Some things aren't for everyone, so find what is for you. I think that small changes like eliminating soda and drinking more water this week, adding a new veggie to your diet next week, and continuously doing this week after week will help to instill real changes in your diet. Fad diets don't last, and are strongly correlated with negative effects. Just eat clean and take it easy. Do you have some recipes you can share with us? 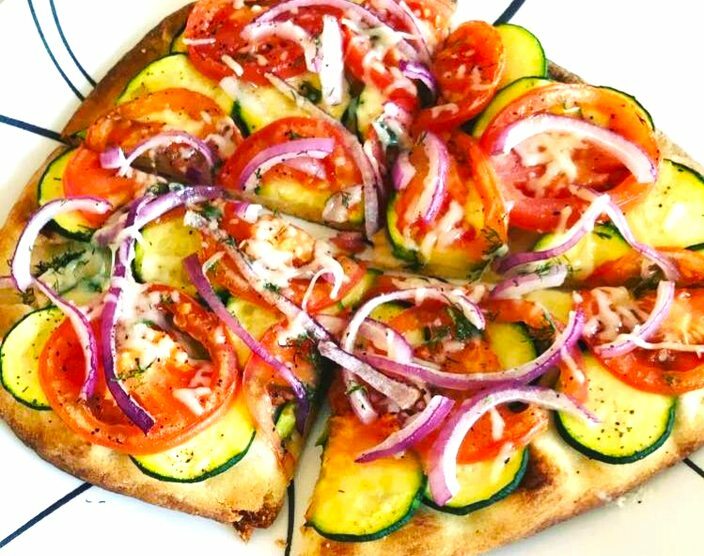 My favorite recipe is my veggie flatbread! Another favorite recipe of mine are my morning juices/smoothies! I use a ninja for my juices because I prefer to keep all of the vegetable and fruit’s amazing qualities in tact! Beet juice: ½ cup chopped beets, 1 kale leaf, ½ cup frozen pineapple, 2 tbsp. of flax seeds and 2 cups water. Berry juice: ½ carrot chopped, ½ apple (favorite kind), ½ cup (frozen) mixed berries (raspberries, strawberries, blackberries), 2 cups water. Juices are fun because you can play with adding nutrient dense vegetables with sweeter fruit to get the best of both worlds! It's kind of a long one but it is truly my mantra. It's helped me get through some tough situations and remind me to work harder for myself and to not worry about pleasing everyone. “The decision to live your life is your own responsibility. The results of your own life are your own responsibility. Your action or inaction becomes your own responsibility. Often other people will have values and beliefs that are in conflict with yours, and when they see you living in opposition to their values and beliefs, it can be very frightening for them because, in a way, it threatens their foundation.” -Anthony, Robert. Massy Arias is a huge role model of mine. She's so multidimensional when it comes to her fitness, and that is something I pride myself in as well. It's not just about lifting weights in the gym or running on a treadmill. Try new things, and enjoy all aspects of working out. Kickboxing, yoga, and hiking these are all great ways to get a workout in while still enjoying yourself. Ainsley Rodriguez is another role model of mine. Another strong woman who is very multidimensional with great health advice on her Instagram page! - The Model Health Show is by far my favorite podcast. Shawn Stevenson is incredibly intelligent and inspirational. His podcasts cover topics from fitness to health and just overall happiness. I recommend it to anyone getting into health and fitness. I will listen to him in the car on the way to work, or school or even during cardio sessions. - My favorite book is The China Study by T. Colin Campbell and the sequel Whole. They are great books for anyone interested in the science behind the effects of animal products on our bodies and why a plant based diet is ultimately better for us; Two life changers for me. I've been slowly transitioning to a vegetarian lifestyle for a little while now and the changes in my health have been phenomenal.